It's been a while since I did a novelty cake, so I decided to give one a go for my birthday party. I couldn't go past the teapot: a group of my friends from Uni, who've dubbed ourselves the co-op crew, used to meet up at the food co-op once a week to indulge in nommy vegetarian food, baked goods and tea (from the mouth of a camel teapot). 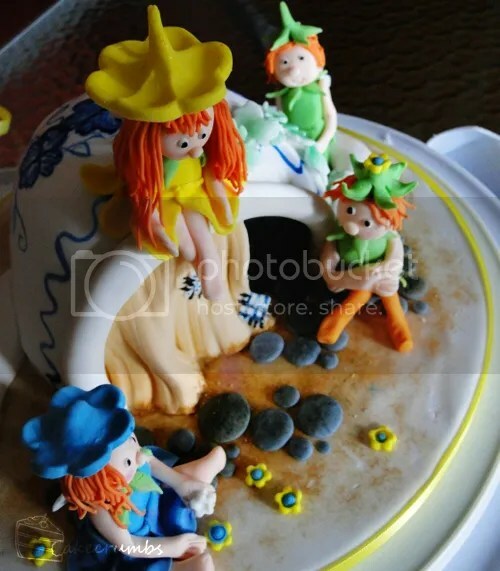 This cake is inspired by a Debbie Brown design, and features a family of pixies that have adopted a forgotten teapot as their house. … or reclining against it, talking about pixies' favourite topics. Like… er… what type of flower makes the most fashionable hats, perhaps? 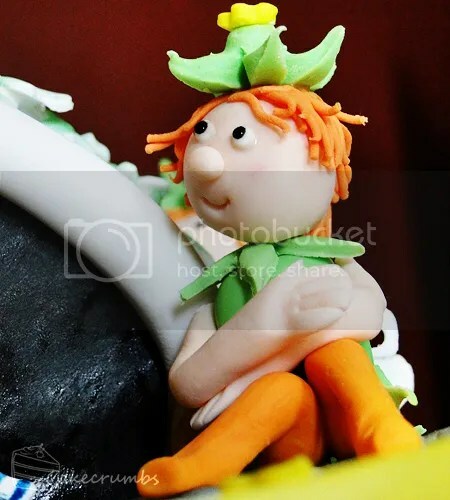 This cake involved something I hadn't tried before in any great detail: painting onto fondant. It's been perhaps a decade since I last painted, so I'm not very confident when it comes to any form of painting. But it was more painless than I expected. Here's the handle side of the teapot, with a vine of ivy creeping over it. And here's a closeup of the painting. I gave all the pixies different wings. 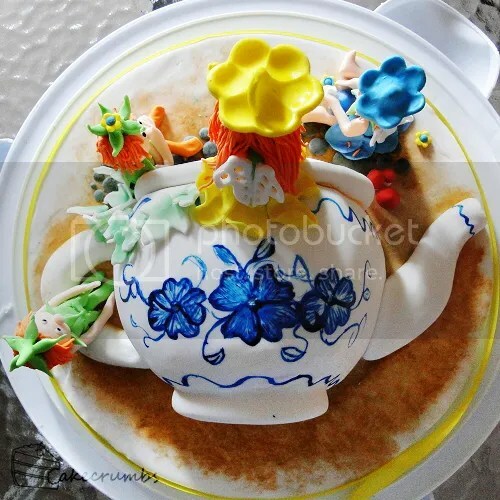 Even the cakeboard was painted to represent the muddy ground, splattered over the base of the teapot. I really enjoyed that aspect of this cake, and it's definitely a skill I look forward to developing and expanding on. This cake was a chocolate madeira cake, layered and covered with vanilla buttercream and finally fondant. 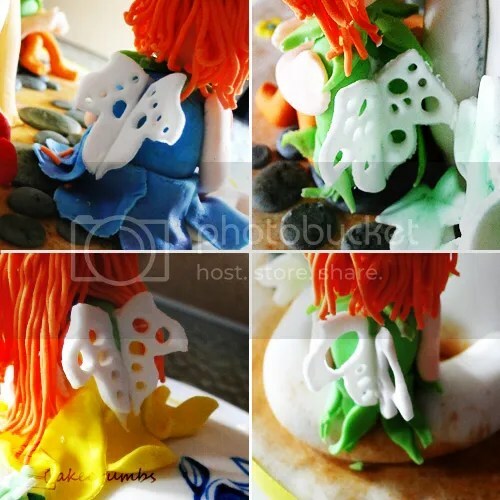 The pixies are also fondant. Their hair was going to be royal icing, but I started decorating this cake at 11pm and was finishing this cake off at 6:40am and figured whipping out the electric beaters was perhaps a little inconsiderate. So fondant it was. 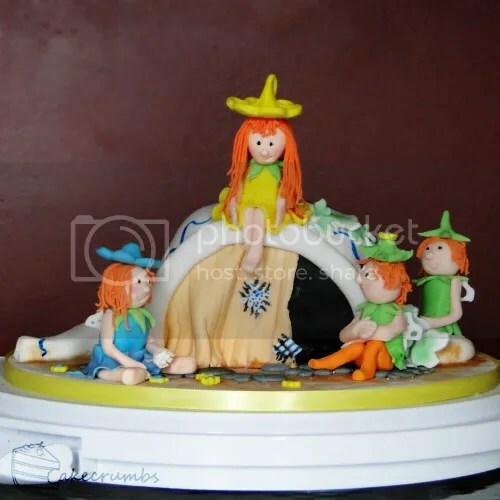 Consequently they don't have the lovely curly hair, and their hats are sitting too high on their heads. 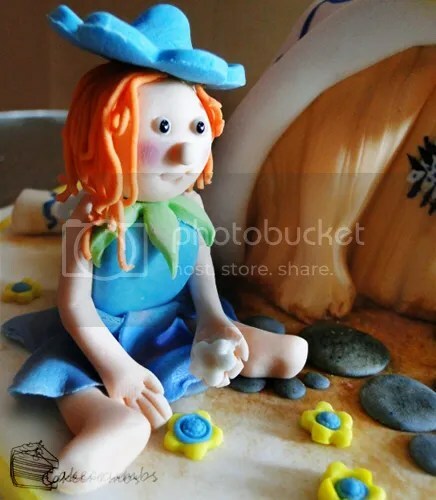 But it was nice to practise human fondant figures since I'm terrible at them because I always do animal figures. This was my second time doing something people-themed. Another awesome job! 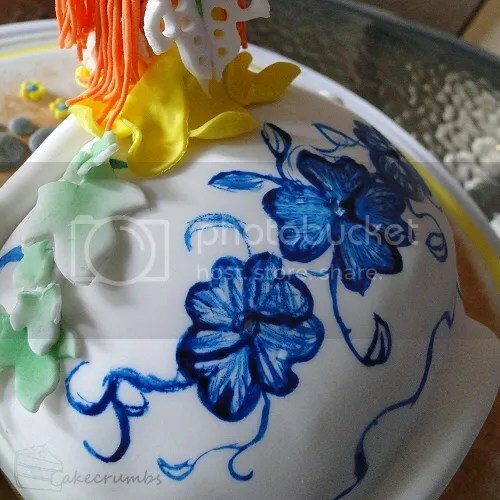 I think the painting on the fondant looked great. I only wish I got to look at it in more detail before these photos. 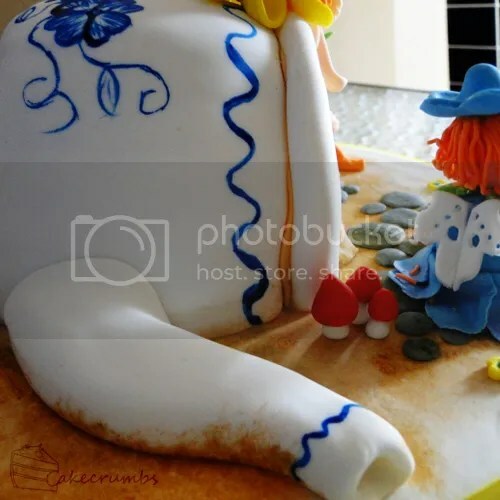 Wow, another gorgeous cake! 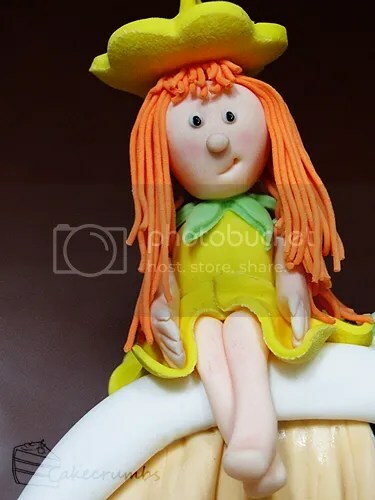 I’m just getting into cake decorating myself, and your cakes are really great inspiration! Aw, that’s so lovely of you to say. I get really excited when people say they are picking up the hobby! 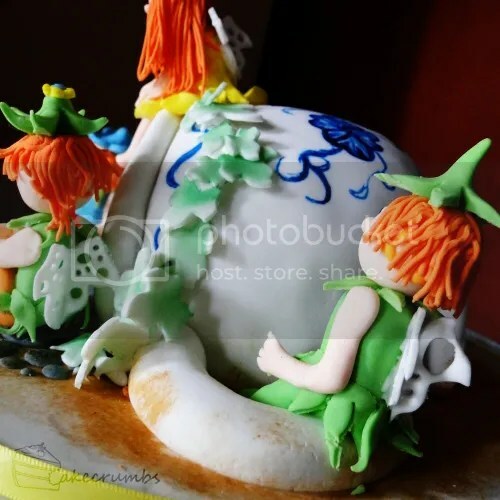 How are you finding the world of cake decorating so far? Challenging? Easy? Fun? It is soooooooo fun!!!!!!! I love it!